Of value to practitioners in the full range of educational contexts, the sixteen wisdom papers in this collection include perspectives ranging from programs and institutions to effective practices to insights about the future of higher education as new models emerge that will improve learning effectiveness, cost effectiveness, access, faculty satisfaction and student satisfaction. Each year, the Alfred P. Sloan Foundation invites practitioners to a workshop to confer and share their practical research on specific challenges of importance to quality online education. These summer research workshops result in the publication of annual volumes in the Sloan Consortium quality series and in online workshops that use the annual volumes as a starting point for disseminating information and building knowledge with a wider audience. Of value to practitioners in the full range of educational contexts, the sixteen wisdom papers in this collection include perspectives ranging from programs and institutions to effective practices to insights about the future of higher education as new models emerge that will improve learning effectiveness, cost effectiveness, access, faculty satisfaction and student satisfaction. Each year, the Alfred P. Sloan Foundation invites practitioners to a workshop to confer and share their practical research on specific challenges of importance to quality online education. These summer research workshops result in the publication of annual volumes in the Sloan Consortium quality series and in online workshops that use the annual volumes as a starting point for disseminating information and building knowledge with a wider audience. 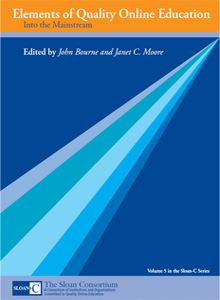 The 2003 Summer Research Workshop produced volume 5 in the Sloan-C series on quality education: Elements of Quality Online Education: Into the Mainstream—focusing on student satisfaction, learning effectiveness, blended environments, and assessment—and in online research workshops that have engaged more than 500 practitioners from many schools, organizations, and nations in exploring new models for excellence in online education. In 2003, summer research workshop participants were also invited to do something new—to provide brief perspectives on topics of their own, relating their own experiences and perspectives that are useful to other practitioners.The sixteen wisdom papers in this collection represent views ranging from programs and institutions, to effective practices, and to insights that will affect the future of learning.